I have recently come across a golf bag cover for playing in the rain. It is called a Seaforth Slicker and is garnering rave reviews. The cover comes in two colors (black and yellow). It's design has been well thought out allowing for quick and easy installation in the event of a sudden squall. 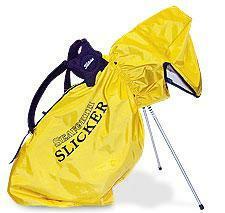 The Slicker uses a combination of elastic, Velcro and snaps to keep the cover in place and fit any bag snugly from the smallest stand golf bag to the largest golf cart bag. There is also a split down the middle of the cover allowing for the carry strap to be pulled through the cover. The bottom of the Slicker is one of the most unique features of the accessory's design. Instead of the bottom just being open and loose like other designs the Slicker is elasticized and will protect the base of the bag from wind and rain. It is certainly true that very few players choose to venture out into heavy rain but when you are caught in a downpour and only have a few holes remaining this bag cover will often make the difference between continuing on or just making a clear bee line for the clubhouse. Before you buy another junky $10 plastic cover check out the Tour tested Slicker.